Ever wondered what it’s like to (temporarily) hang up your editor’s hat and write your own book? To have it published by your employer? 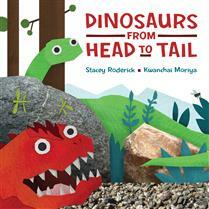 We asked Kids Can Press senior editor Stacey Roderick, whose first picture book, Dinosaurs from Head to Tail (illustrated by Kwanchai Moriya), was released by Kids Can in March. You’ve been editing children’s books for almost 15 years, but (other than collaborating on Centsibility in 2008), haven’t really ventured into author territory. What prompted you to write a picture book now? It is something I’ve always wanted to do – I have a lot of story fragments sitting in a file on my computer. And now that I have a young son, I spend even more time reading picture books than I did before. But to be honest, I’m not sure I would have dared try it if the opportunity hadn’t presented itself through my development work as an editor. Both of your titles have been published with Kids Can. Did you consider working with other publishers? How did the book come about? Actually, both books came about as a result of my editorial work. Ideas for non-fiction titles are frequently generated in-house by the editors, and every so often we have brainstorming sessions when we share these ideas and talk about possible creators. When I presented the Dinosaurs from Head to Tail concept at one of these meetings (complete with a cut-and-paste dummy that I had more fun making than I should admit to), Val Wyatt suggested I write it. I guess it just made sense since I had such a clear idea of what the book would be. What was the experience like of working with colleagues on your own title? It was a great experience – quite seamless really. Although I was the lead editor on Dinos, I had a lot of support editorially, including having another editor review and make notes on the first draft. I think because of this unusual situation, I depended even more than usual on Julia Naimska, the designer, and DoEun Kwon, the production editor, as well as the copy editor and proofreader. All in all, it was a wonderful reminder of how very collaborative this work is. Dinosaurs from Head to Tail has been getting great notices, including in the New York Times Sunday Book Review. What does that feel like? I have to say that it has been totally unexpected. I feel very lucky indeed. Of course, so much of the positive response has been to Kwanchai Moriya’s truly fantastic illustrations, so I am thrilled for him, too. There is no shortage of dinosaur books on the market. How did you make yours stand out from the crowd, and what prompted you to take on such a well-covered subject? My son went through a pretty obsessive stage so I think I have read most of them. What seemed to be missing, or at least there were fewer of, were the informational books that provided more content than a concept book but weren’t as overwhelmingly detailed as the books using a more encyclopedic approach. I also noticed that my son really responded to books with a more interactive format, which is where the guessing game idea came in. And I think most kids (mine, for sure) get a lot of satisfaction from being right so I made sure to include dinos that were popular enough that young readers would be able to shout out some, if not all, of the answers. Our choice of illustrator was also key to the book’s appeal – as eye-catchingly wonky as Kwanchai’s dinosaurs are, he made sure to work from visual references. You’ve recently been promoted to senior editor. What does that mean for you, in terms of what you’ll be doing, and also personally? That’s something I’m feeling really good about, too. I’m looking forward to focusing even more on acquisitions and development, as well as working with junior staff in a mentoring capacity. Those are really the key changes in my role. What are you working on right now that has you excited, either as an author or editor? Ocean Animals from Head to Tail (Fall 2016) is well underway, and I’m super excited to see Kwanchai’s sea creatures. Speaking as an editor, it’s hard to choose but this fall I’m particularly proud of our newest CitizenKid title, Child Soldier: When Boys and Girls Are Used in War, written by Jessica Dee Humphreys and Michel Chikwanine and illustrated by Claudia Dávila. It’s the powerful and very affecting story of Michel’s time as a child soldier, as well as a tribute to his father’s legacy as a human-rights activist. It’s told in graphic novel format, and every panel is stunning and emotionally resonant.